Couldn’t make it to the CUNY Open Access Week events last month? Catch up on all the happenings right here on our website. Visit the page for each event (links in the sidebar on the right) to find handouts, slides, and notes from speakers and attendees at each of our OA Week programs. Add a comment or two and join in the conversation about Open Access! We’ve already started thinking about ways to make next year’s Open Access Week @ CUNY even bigger. If you’ve got ideas or would like to join in the planning, please get in touch! Contact Beth Evans, Brooklyn College Library, or Maura Smale, City Tech Library. Still more OA events this week! October 20th, 2010 · Comments Off on Still more OA events this week! Open Access: How it Works / Will it Work for You? Join a discussion of the viable models of open access publishing, learn where open access journals are indexed and come to understand the impact of open access publishing. Learn about the government position on open access publishing, lobbying efforts to make information more accessible, student activism around the issue and the new, emerging Reader’s Bill of Rights for Digital Books. Visit this event’s page for more details and to add your comments or join the discussion. OA Week is fast approaching! October 15th, 2010 · Comments Off on OA Week is fast approaching! We’ve added the details about our programs next week: visit the Events page or the pages for each event for more info. Each event’s page has plenty of room for comments, so please feel free to add your questions or thoughts about open access to the discussion. We’ve also uploaded promotional materials to the website, including fliers as well as templates for spiffy orange CUNY OA Week stickers. Find them on the Publicity Resources page. Please let us know if you have any questions about next week’s events. 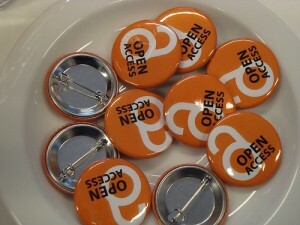 We’re looking forward to lively discussions about open access publishing. In May 1883, in response to a population explosion, the Brooklyn Bridge opened a new, free path between the cities of New York and Brooklyn….In October, 2010, in honor of Open Access Week and in response to an information explosion, the CUNY colleges of Brooklyn will show faculty and students free and open paths to scholarly information. Please join the Brooklyn College Library and the Ursula C. Schwerin Library, New York City College of Technology, in marking Open Access Week this fall. The Open Access movement has threaded its way into many avenues of human culture. Creators of literature, music, film and art are acknowledging the rich heritage that has enabled their own creative thinking and in turn are offering their productions to the greater community at no charge. Academic publishing has situated itself in the open access arena. The output, online, open-access scholarly literature, measures up to the same standards as other peer-reviewed and removes the economic and logistical barriers to access. Open Access Scholarly Publishing: How Can Faculty Get Involved? Are you a faculty member interested in publishing your research and scholarship via open access methods? Join us to explore the practical considerations of OA publishing for faculty. We’ll discuss identifying OA peer-reviewed journals, using Creative Commons both to license your work and use work that others have licensed, and Open Journal Systems: a free, open source platform for publishing scholarly journals. Performance and panelists including Doug Geers (BC/Music), Michael Mandiberg (CSI/Media Culture) and Nina Paley (http://www.ninapaley.com); full screening of Nina Paley’s Sita Sings the Blues to follow panel presentation. Filmmaker Brett Gaylor explores issues of copyright in the information age. The film’s central protagonist is Girl Talk, a mash-up musician topping the charts with his sample-based songs. Creative Commons founder Lawrence Lessig, Brazil’s Minister of Culture Gilberto Gil, and pop culture critic Cory Doctorow are also along for the ride. Open access textbooks and other curricular materials are popping up all over. What are the advantages for you and your students? How can you find and use these materials? Come learn about freely-available textbooks and more for your courses. We hope to see you there for a mind-opening look at open access.